← Am I a good Mum? Saturday didn’t sneak up on me like it did last week. 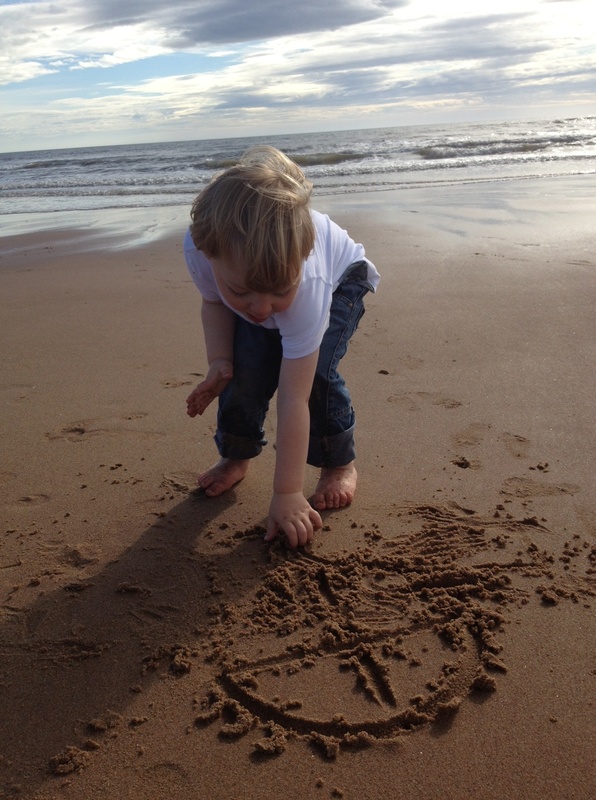 Last night I decided the wee man and I would spend the morning at the beach. It’s one of my favourite places in Aberdeen and a real perk of living here, so would kill the morning perfectly. Isn’t it funny that the more relaxed you are, the easier things become? Two lovely unexpected things happened. First, the sun blazed defiantly, as if to mock late September. 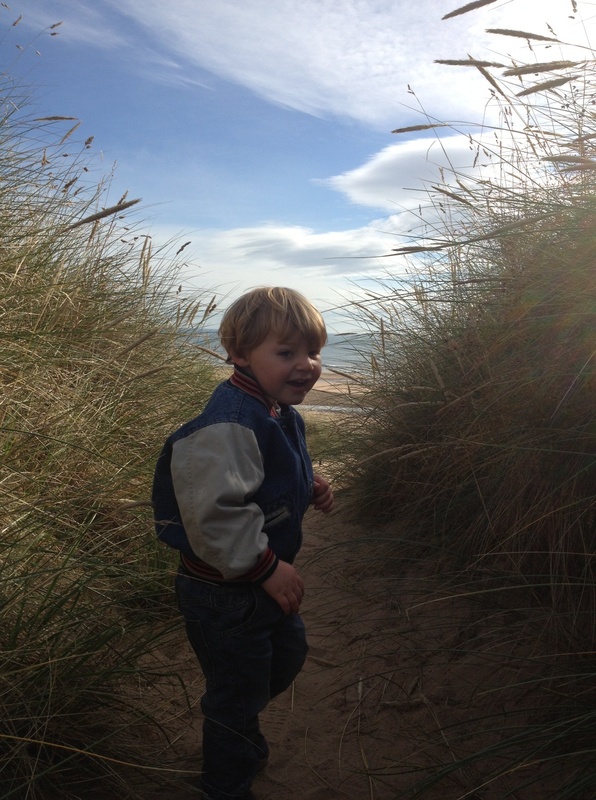 The wee man and I ran around the playpark at the entrance to Balmedie beach, shedding layers and squinting. We shared a packet of Hula Hoops on a bench and he slurped his juice, swinging his legs and grinning up at me. I suggested we went down to the sea and he nodded happily. It takes a while to walk through the dunes, but we weren’t in any hurry (another lesson from last week). The wee man gathered feathery stems of grass and poked at the fluffy heads of gone-to-seed thistles. As the path became steeper I had to carry him but I enjoyed the anticipation of the view that would greet us at the top. I’m glad I didn’t let him go completely when I took this photo – there’s been quite a lot of erosion since we were last there and the path dropped steeply to the river. 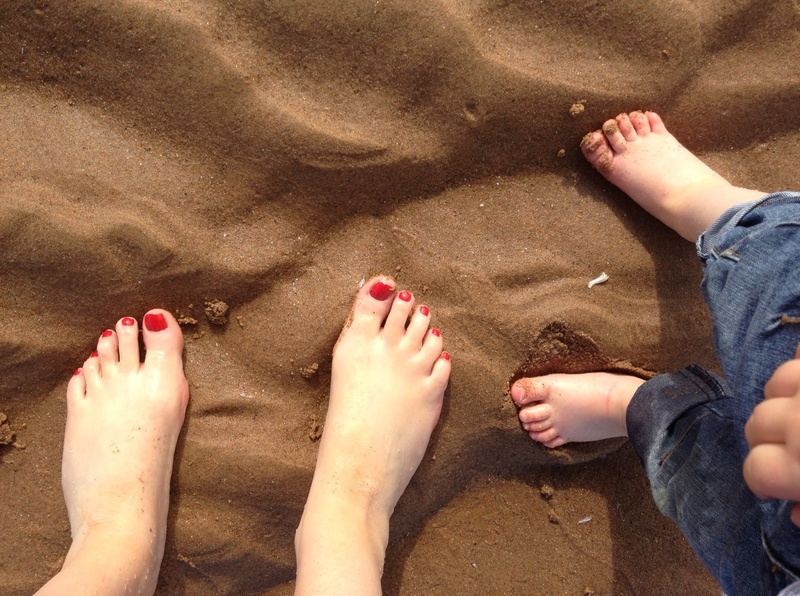 We found an alternative route, took off our socks and shoes and ran out onto the sand in the sunshine. For once he held my hand properly and together we stomped through the rivulets of water on the hard, wave-marked sand. He’s not too sure about the sea, so we stayed a little bit back and drew pictures instead. Then the second lovely thing happened. The wee man spotted another boy and ran over to him. He was eating raspberries from a tupperware and was happy to share. Embarrassed, I ran up to pull the wee man away, but the dad reassured me it was fine, so I supervised from a distance. We struck up a conversation and it turned out his wife had studied in Glasgow. He suggested lots of new places for me to explore, including another beach at Newburgh. We swapped stories of the trials and tribulations of toddlers (he’s the tidy one in his family too) and the two boys played together beautifully for twenty minutes. I’ve said before that the wee man opens lots of doors for me, and I appreciate that more than ever in a new city. People have told me Aberderdonians are not generally friendly, but I’ve found the opposite. They’re usually pleased I like it so much here and happy to share inside information.